Choosing the right material for your roof can be an overwhelming process. With so much to choose from, many people find themselves overwhelmed and just plain confused. When it comes to your roof, there is always the classic battle between metal and shingles. To help you make your decision, here are the benefits of a metal roof versus a shingle roof. The cost is a primary motivating factor for a lot of individuals looking to replace their roof. Shingles certainly win in this category, being 30%-50% cheaper than metal. If you’re simply covering a small barn or exterior apartment, the cost difference may not be immense, but when if you increase the square footage to the size of an average home, you’re looking at big savings. While shingles have improved greatly in the last few years in their ability to withstand weather and other natural damage, metal is the superior material in this category. 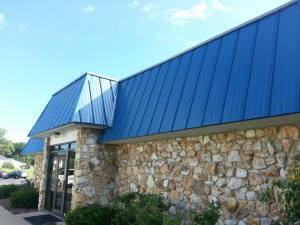 Metal roofing is often galvanized, making it immune to rusting. It can also last 10-15 years longer than shingles on average without breaking or chipping. One of the most common annoyances when it comes to roofing is the potential maintenance required to keep it up to date and safe. Unfortunately, shingles do require moderate maintenance throughout the years, as its material is not as tightly sealed as metal alloys. Therefore, metal is also a better choice if you’re looking for less maintenance, as it rarely requires any throughout its whole life time. While everyone has their own opinion, most people agree that classic shingles provide better visual appeal. From Spanish villa themes, to western European cottage styles, to your everyday American home so often touted in magazines, shingles seem to be the most popular choice in modern day. Metal, while it can look modern and chic, sometimes causes a more industrial look than is preferred by many homeowners. For this reason, shingles win this round. Choosing a new roof for your home can be an exciting and challenging experience. With more and more materials being invented to put on top of homes everyday, the apparent choices can be intimidating. That’s why it’s important to know what’s important to you in terms of cost, durability, maintenance and aesthetics. Hopefully, this breakdown has helped you move forward to choose the roofing material that will truly be the best fit.